Have you just about given up on finding the perfect garage door for your property? Dynamic Garage Door is here to solve your dilemma. With our help, you can get stunning custom garage doors in Santa Barbara CA that will be the envy of all the neighbors. 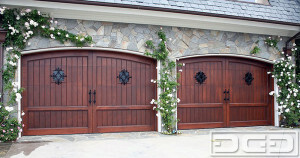 Carriage style doors are one of the most popular types of custom garage doors in Santa Barbara CA we make. They are especially nice on detached garages to complete the original carriage house look, but they can also be updated to look totally at home on attached single or double car garages. At Dynamic Garage Door, we can create charming carriage style doors to whatever level of authenticity you require. We make both traditional swing-open doors and more convenient modern roll-up doors. Sometimes when people think “custom garage doors in Santa Barbara CA” they imagine something fussy with lots of detail. But in reality, custom doors can also be created with the sleek minimalism required for contemporary and mid-century properties. When we design for these architectural styles, we place even more emphasis on the quality of the materials and make sure they really stand out in the design. At Dynamic Garage Door, we don’t just craft custom garage doors in Santa Barbara CA. We also help you care for your doors. The first and perhaps most important step is professional installation of your new doors. We also provide garage door maintenance and garage door repair services designed to preserve the beauty and functionality of your doors. It is wise to trust us with these activities rather than your average contractor, because we understand the specific maintenance needs of your custom doors. If you would like to learn more about designing your dream garage doors with Dynamic Garage Door, Call 855-343-3667.